For some people it comes naturally to try and understand the minds and motived of those around them. They find themselves constantly trying to psychoanalyze those around them, sometimes with great success and for others it seems to be a fruitless search for understanding. 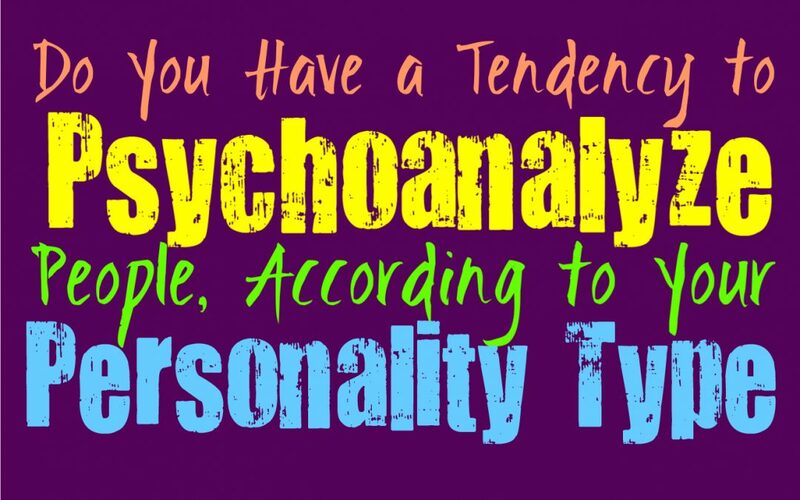 Here is how often you search to psychoanalyze and understand the minds of those around you, based on your personality type. INFJs don’t necessarily enjoy psychoanalyzing people, since their ability to understand others comes from a more natural and intuitive sense. They don’t need to consciously dive into the minds of someone else in order to understand what they are feeling and what is going on inside of them. There are some INFJs however, who enjoy taking this to the next level to really understand how people’s conscious and subconscious minds are working and processing things around them. For the INFJ understanding people is definitely important and even helps them to understand themselves better. ENFJs are definitely drawn to understanding others and how their minds operate and process things. For the ENFJ most of their analysis comes from their intuitive and emotional ability to understand those around them. They care about their loved ones and so they strive to understand what is going on inside of them, on many different levels. For the ENFJ sometimes being in a psychology career is actually rewarding for them, since it focused on understanding deeper levels of how people function and how their minds and inner emotions operate. INFPs prefer to give people space to share their inner emotions and secrets with them, instead of trying to actively psychoanalyze them. While some INFPs might be drawn to this process, that is only if it something they personally inspired by. For the most part INFPs don’t like making people feel uncomfortable or forced to open up about themselves. They believe that this should happen when the time is right and when the connecting being made is truly sincere. ENFPs aren’t often fans of having to psychoanalyze others, but they might do this to themselves fairly often. For the ENFP it sometimes feel unnatural and invasive to try and psychoanalyze the minds of those around them, and possible a bit unhealthy. They would rather give people space and room to share themselves when they are ready, and often believe that people should seek to understand themselves and their own processes. They do care about understanding their loved ones, but they don’t need to psychoanalyze them. For the INTJ psychoanalyzing and understanding the inner workings of someone’s mind, is interesting simply because of how complex it can be. They want to know as much as they can, and never find themselves wanting to remain stagnant when it comes to information. Some INTJs might be truly interesting in learning how people’s minds work and how their subconscious and conscious interacts. For the INTJ it is about the usefulness of it, and more directed at the brain rather than understanding people. ENTJs are definitely interested in being able to psychoanalyze people, since it can be a useful tool in the future. If they are around people who are difficult to understand and might be struggling with certain things mentally, they want to understand how to operate around these people. For the ENTJ it isn’t so much about being curious, as it is about knowing how to navigate and understand people. They are focused people who don’t like being in the dark about anything and so all information is fair game to them. The mind and the way it works is often very intriguing for the INTP, even the potential negative sides of this. They want to understand how people process things and how their subconscious and conscious minds interact. They often find themselves diving into information and so they want to learn as much as they can about everything. Many INTPs find themselves truly wanting to understand how people will respond to most things and where their motives are truly coming from. Psychology on so many different levels is often something which the INTP is extremely curious about. ENTPs do sometimes find themselves curious about understand the mind and how different processes might work. For them psychoanalyzing is something they are drawn to simply because they are curious people who strive to learn as much as they can. ENTPs are definitely interested in learning about the mind of those around them, and even of people who behave in such uniquely different ways. They want to dive into more complex ideas and information, and so understanding how to psychoanalyze people is definitely something of interest. ISTJs aren’t often interested in psychoanalysis, since it offers too much which can be open to debate. ISTJs prefer to focus on facts and things which are solid and tangible in their lives. They want to be able to understand their loved ones but in a much more practical sense. For them having to dive into someone’s mind to uncover certain subconscious details, really isn’t the most rewarding experience. ISTJs believe that people should handle their own business and even their own inner minds, without having others invade this type of personal space. ESTJs aren’t often focused on psychoanalysis and might even find this to be a bit daunting and silly. They are very practical people and so if something is not tangible then they struggle to really spend much time on it. ESTJs believe in taking care of their own business and want to be able to have a sense of distance between them and too much focus on psychology. While some ESTJs might have more of an affinity for it, they often focus on things which they have more personal experience with. ISFJs are very focused on the people around them, and so they might be drawn to psychoanalysis. They want to understand every layer of their loved ones and sometimes this means understanding the parts of them deep within their minds. For the ISFJ their focus is often more on emotions though, and simply understanding how to take care of their loved ones. They can be a bit more drawn to practical needs and understanding how to create a sense of peace, rather than stir things up. ESFJs can be extremely curious about how other people’s minds work and what is really going on inside of them. Because of their natural drawing to understanding others, ESFJs do sometimes find themselves wanting to psychoanalyze and understand people. Sometimes the idea of being in the psychology world or becoming a therapist, is truly enriching for them. They are so focused on tending to the needs of others and so for the ESFJ trying to connect with and understand the motives of people is definitely something they are comfortable with. ISTPs aren’t often interested in psychoanalyzing people or needing to understand their inner minds. For the ISTP certain psychology processes can certainly be interested on the surface, but only because they are curious people. They enjoy understanding how these things work and how certain subconscious and conscious aspects of our minds interact. For them it is rewarding to learn as much as they can, but that doesn’t mean they need to dive too much deeper than a basic understanding. ESTPs can certainly find themselves curious about the mind and how it works, sometimes in a more morbid way. They are drawn to understanding certain mental illnesses and how people’s brains function who struggle with these things. For the ESTP it is about being curious and wanting to understand things that most people might not really want to dive into. They are factual people who do enjoy being able to learn and understand as much as they can about their minds and how they function. While ISFPs enjoy understanding their own emotions and learning about the inner workings of their loved ones, psychoanalysis isn’t something they often find themselves drawn to. For the ISFP this can feel a bit overwhelming, with little reward for them in the end. They don’t necessarily want to dive into these deeper workings of the mind, and are often more interested in focusing on things which they can tangibly enjoy in the present moment. For the ESFP psychoanalysis isn’t often the most intriguing aspect of psychology or the medical field. While some ESFPs might make for excellent doctors or nurses, the psychology side of things can be a bit overwhelming for them. It can feel a bit too unsettling and leave the ESFP a bit bummed out with how some people have to endure certain things within their minds. Psychoanalysis isn’t often something ESFPs are interested in, and might even be something they want to stay clear of.